One of the more popular fragrant viburnums, Viburnum x bodnantense ‘Dawn’ (picture right) is much loved for its flowering period, autumn to spring. 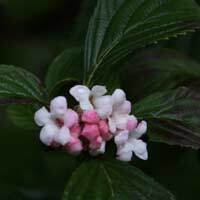 This is a deciduous small to medium sized shrub that will reach around 3m in height, flowers appearing on bare wood from winter to spring. The natural growth habit is upright, and this lends the plant to a range of landscaping applications. Over time the plant develops into a miulti stemmed shrub, and as canes age they can be pruned back to encourage new vigorous growth. A cross between V. grandiflorum and V. farreri with its white flushed pink tinged flower buds opening to white fragrant flowers this is a must for the garden in winter. Used widely in the garden border it adds color and fragrance in the cooler months. V. x bodnantense ‘Dawn will reach 3m and has dark green glossy oval shaped leaves. An upright habit make it a suitable plant for the back garden border, planted against a contrasting background so its flowers can be allowed to be the stars in winter, or it can also be used as a deciduous hedging plant, with the benefit of winter flowers. Preferring a humus rich moist soil in full sun to part shade another to consider is V. x bodnantense ‘Charles Lamont’. This is a very easy plant to prune, it is strong growing and will recover well from even hard pruning.